"Located on Elm St. - just West of Hwy 6"
A very unique opportunity. 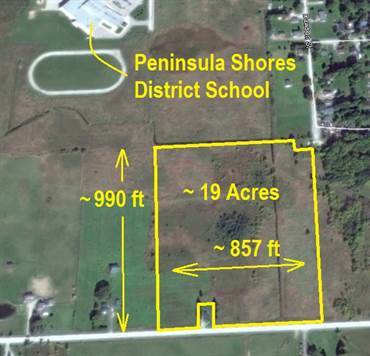 19 acres in the SW corner of Wiarton across the road from the proposed sub-division. Just 1500 feet West of Hwy 6 (Berford St) on Elm Street. Build your dream home in the `country` and walk downtown to shopping, parks, school, library, hospital, marina, etc. Services at road (hydro, phone, garbage pick-up) including natural gas.